The prospect of a military standoff between the U.S. and North Korea seems more imminent than it has in many years. As the possibility of violence looms, I sought out Jean Lee, a veteran journalist based in Seoul, for a perspective on how the crisis feels from the vantages of both North and South Koreans. 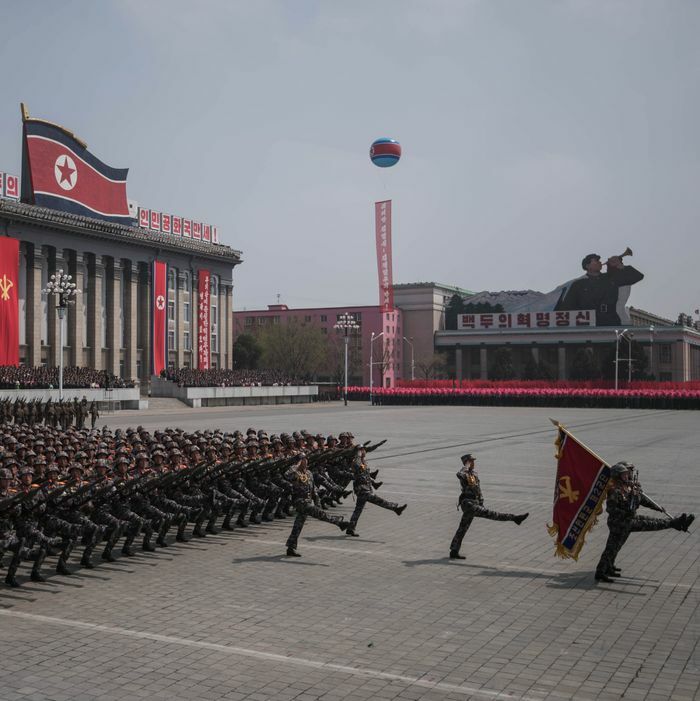 In 2012, Lee launched the Associated Press’ first bureau in the North Korean capital, and she’s spent several years zigzagging between the two countries, covering every subject from health care to soccer, without ever straying too far from politics. Lee, born in Minneapolis to South Korean parents, now does research from Seoul as a fellow with the Wilson Center, a think tank focused on international relations. When you were the AP bureau chief in North Korea, did you get a sense of how the citizens there feel about the government? It really varied. I think that when Kim Jong-un emerged, he was very young, vibrant, and healthy compared to his father, and there was a very clear sense of hope on the ground. People were starting to see changes, because the succession campaign to prepare him or groom him to become leader came with all kinds of change: new construction, an emphasis on science and technology. The regime propaganda masters wanted the public to associate these things with Kim Jong-un. He built all kinds of leisure facilities, sporting facilities, spas, things to show the people that he cared about their standard of living. That doesn’t necessarily mean people across the board in North Korea benefited from it. Most of these resources were focused on Pyongyang, where the elites live. But because they were starting to see all this change, there was definitely a sense of hope that things were going to be different. I think, though, that it comes with a sense of uncertainty — about what it means, and how he was going to carry out those changes. I’m not sure that we’re out of that period of uncertainty. The North Koreans are probably still trying to figure out how to navigate the country under Kim Jong-un and under the new rules. Besides new construction, what kind of change are we talking about? There are two things Kim Jong-un has emphasized: building the economy and building nuclear weapons. Besides the pressure on the scientists who are building nuclear weapons, this also puts a lot of pressure on those who are tasked with helping to raise money for the country. Whether you’re a factory worker who has a really difficult quota to meet, or if you’re working overseas — say, in a restaurant — and you’re tasked with bringing hard currency back. Now the sanctions make that difficult. And more weapons mean more sanctions. Why is weapons development so important to this regime? North Korea is a very small, impoverished country — one of the poorest countries in the world. The leader of North Korea, from Kim Il-Sung onward, has always made keeping the country intact a priority. What that means for Kim Jong-un is showing his people that he is able to defend them, and that he’s got these nuclear weapons that can not only threaten the world’s largest superpower, but perhaps eventually bring them what they want. You have to remember that even though, in our heads, the Korean War ended more than 60 years ago, according to North Korean ideology, it’s still going on. In many countries that are at war, the threat of an outside force does really serve to bring the people together. It does build a sense of nationalism and unity. What they want is to have a missile launch or a nuclear test to show off to their people, to show them they’re a strong nation. How do most ordinary people in North Korea feel about South Koreans, and vice versa? Given that most current citizens were not even alive before Korea was divided into two separate countries at the end of World War II. Let’s start with South Korea. My parents were children during the Korean War, so they remember what it was like when Korea was one country, and they also remember what war was like and what it was like to survive it. That generation, my parents’ generation, has an attitude very different from, say, my young cousins here in South Korea, who grew up in a democratic era, in a post-conflict period. The older generation tends to be very conservative and very hard-line. That said, they harbor a certain amount of nostalgia for the time before the division. It sounds contradictory, but I see that contradiction not only in South Koreans but also in older North Koreans. Younger South Koreans are very different. It’s almost as if they grew up in a different South Korea. Their parents grew up in an impoverished, war-torn, completely destroyed country that was reliant on the U.S. for anything. The younger generation grew up in a country that has reached developed nation status, has a vibrant economy, has a young democracy, and has been completely cut off from North Korea. They’ve grown up oblivious, to a certain degree, even though the threat of provocation is always there. They’ve also grown up in a South Korea that is very strict about its national-security law. They’re blocked by law from accessing information about North Korea, so it limits their awareness and understanding of it. They don’t really see North Koreans like their grandparents did — as the same people as them. They see them like the poor, pathetic cousin. I should also point out that South Koreans who are my age, in their 40s, would have grown up with very virulent anti–North Korean propaganda. That has changed. From the North Korean perspective, their propaganda calls for reunifying the country. Their ideology is built around getting U.S. troops off of Korean soil. They are told to see South Koreans as kind of puppets of the U.S., or enslaved by the U.S.
How seriously do people in South Korea, in your experience, take the threats and the weapons development in the North? The headlines overseas have been just hysterical. I think you’d be surprised if you were to see the headlines and watch cable TV here in South Korea during the same period, because there was very little coverage of the rhetoric from North Korea. This peninsula has been in a state of war for 67 years, so the rhetoric is nothing new. It happens every spring. If you’re coming to the story for the first time, it sounds really dramatic. But if you’ve seen it now, like I have, for the ninth year — I could almost tell you, on the day, what they’re going to say. However, what’s different this year is Donald Trump. North Korea is pretty predictable, in a certain sense. They’re often characterized as unpredictable, but there is a pattern to Kim Jong-un’s behavior. What’s unpredictable is Donald Trump. The fact that he had approved the dropping of the bomb on Afghanistan and the air strike on Syria just before all of this tension certainly had people nervous. But also, personally, I don’t think South Koreans are as concerned as they should be about the pace of North Korea’s nuclear program. The pace is just astounding. The particular technology North Korea is going for is really aimed at the U.S., and it’s not necessarily meant to threaten South Korea — although, of course, by hosting U.S. troops, South Korea becomes a target as well. Right. North Korea might be predictable, but it’s genuinely getting somewhere with its weapons development. Yes. You don’t want their weapons program to get that sophisticated, because it’s not just a matter of “Will they strike?” There’s also the question, “Who will they sell it to?” There are no international U.N. monitors checking these sites, so there’s also that nuclear-security issue. There are a lot of different reasons to pay attention to this activity. But on the streets of Seoul, people are much more concerned about their own country’s political upheaval, and more concerned about getting jobs and doing the things they need to do to get ahead in life in South Korea. Do you think the sanctions will eventually encourage North Korea to negotiate? I don’t know that it’s the sanctions that will. But their stated objective for the long term is to sit down with the U.S., and to hash out a peace treaty and reunify the country. Whether or not that’s really what they want to do is another issue. But we’ve seen this cycle over almost the past 30 years: tensions, followed by a cooling-off period, followed by tentative moves toward engagement or negotiation. However, this is precisely what Pence and Tillerson were addressing when they said, “The era of strategic patience is over.” Because any of the deals that have been hashed out as a part of this process have fallen apart. True, though I’m not sure all the blame lies with North Korea. No, definitely not. There is that pattern, though. I still haven’t seen clear, concrete details from the Trump administration about how they plan to carry out this new policy that is not strategic patience, and how they anticipate that will change North Korea’s behavior. We’ll see whether they’re able to break that pattern. But the North Koreans do want to get to the table with the Americans, because these deals bring much-needed concessions: food, aid, oil. I’m not so sure they’re willing to give up their nuclear weapons, but they want to get to the table and negotiate. They would want a lot for giving the weapons up. The weapons are a big bargaining chip for them now. Yeah, exactly. They call it, in their state media, their “treasured sword.” I don’t think denuclearization is going to be simple — nobody does — but what the U.S. wants is to not get burned. U.S. leaders are saying, “We’re not going to sit down with you unless we can find a way to hold you to any agreements.” That’s going to be very challenging, because they’ve broken the deals in the past. There’s no easy way out of this. In Seoul, what’s the prevailing opinion about Donald Trump? I think that sentiment has shifted. When he was campaigning, one of the things that really incensed South Koreans was that he characterized them as this rich country that is freeloading off the U.S. military. He had vowed that he would make the South Koreans pay to have the U.S. troops on their soil. It represented a gross misunderstanding of why the American troops are on South Korean soil. The South Koreans do pay half the expenses of keeping the troops, but I would argue — and hopefully he understands this now —that the U.S. has interests for wanting tens of thousands of troops in the Asia-Pacific region. It’s as much for U.S. security interests as it is for South Korean security interests. Of course Trump has backed off of that. South Korea’s still in the middle of a political transition. The president, Park Geun-Hye, was impeached not long ago, so the protesters who were pushing for impeachment are mostly off the streets now, but her supporters are on the streets, and they’re largely an older group. They also support a strong partnership with the U.S. This is the generation that remembers the U.S. protection and its importance. I’ve seen some of them holding interesting signs supporting Trump as well —supporting any kind of action he wants to take. So there is that older generation that will support anybody who’s American and who’s in favor of a strong militaristic U.S. presence. I think that generally speaking, though, South Koreans have been so concerned about their own political upheaval that they haven’t been paying as much attention to Trump as they might have. How about the news last week that the U.S. aircraft carrier wasn’t headed for the Korean Peninsula when he said it was? That has been a top news item, obviously. I did ask periodically, over the past couple days, where is the armada now? They said it was in the Pacific, but they never clarified when it would arrive. I think the lack of clarity provided by the Pentagon and the White House was very upsetting to South Koreans. Are there any other particular misconceptions about North Korea that you’d like to clear up for your fellow Americans? The one thing I would say is that too often in America, we portray them as a caricature. The people living there are human beings with the same kind of desires and frustrations as anyone else. They’re just living in incredibly difficult circumstances.